A Software Engineer specializes in areas of software development like networking, operating systems, database management or applications, etc. 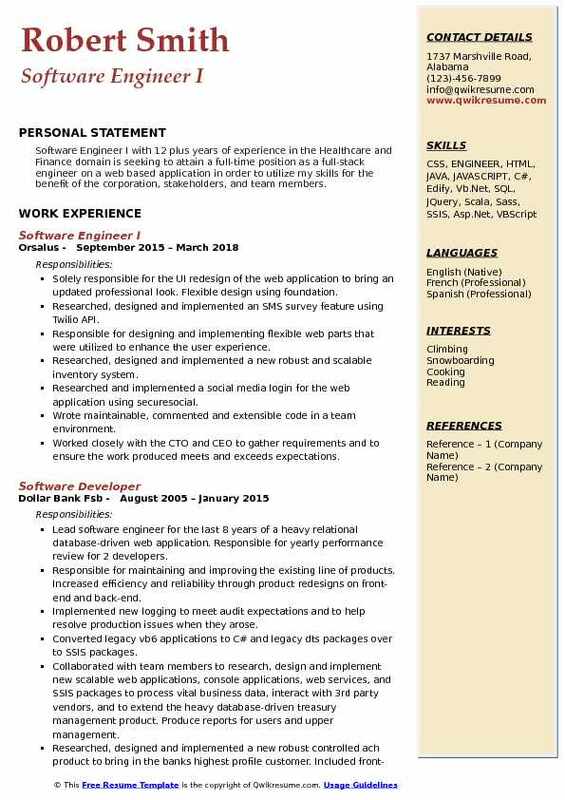 The roles and responsibilities commonly seen on a Software Engineer Resume include writing, editing, and testing software programs. This can either be developing a program from scratch or making changes to existing ones. The job also involves working in collaboration with other key professionals like software tester, software quality assurance engineer, etc. The key skills that make a good Software Engineer knowledge of various intricacies in the field of software development, being up to date with the latest software trends, ability to collaborate and work as a team with other software professionals, etc. 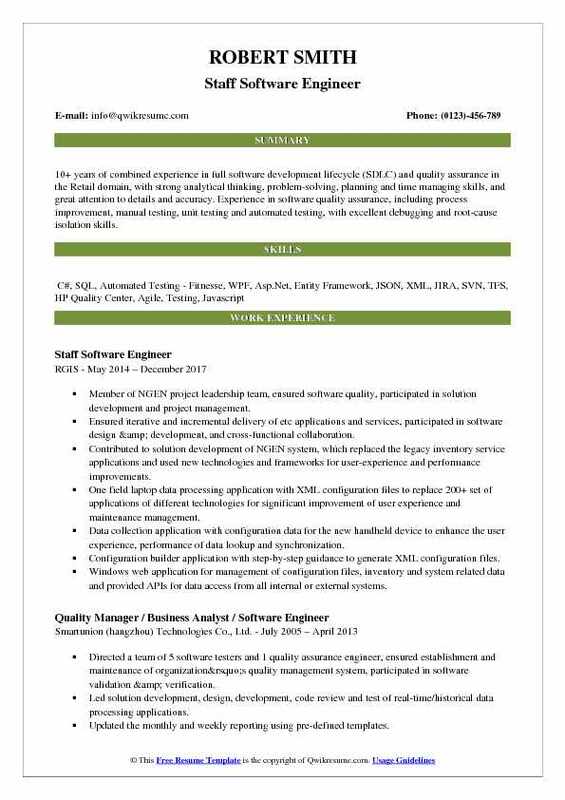 The minimum educational qualification expected for this role is a Bachelor’s Degree in Computer Science and Engineering or Information Technology. Work experience in the relevant field can be an excellent advantage to embark on this exciting career. 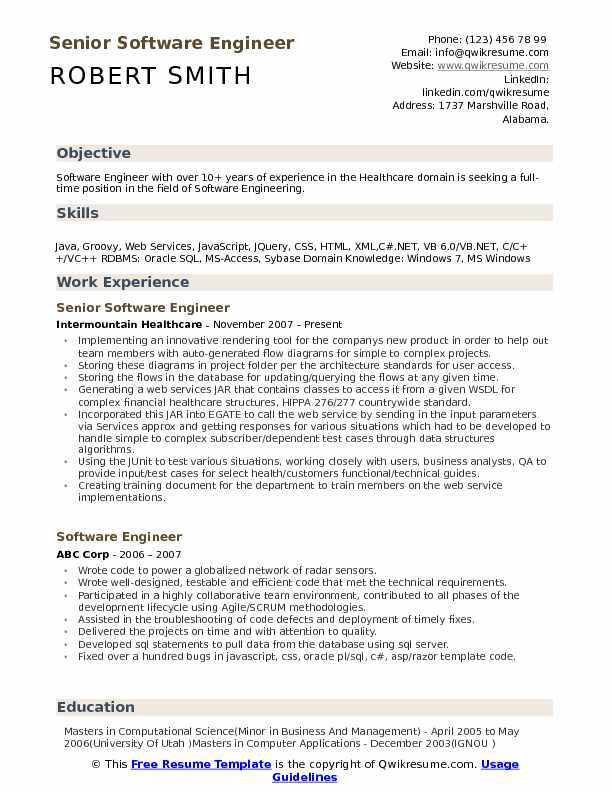 Summary : Software Engineer with over 10+ years of experience in the Healthcare domain is seeking a full-time position in the field of Software Engineering. Implementing an innovative rendering tool for the company's new product in order to help out team members with auto-generated flow diagrams for simple to complex projects. Storing these diagrams in project folder per the architecture standards for user access. Storing the flows in the database for updating/querying the flows at any given time. Generating a web services JAR that contains classes to access it from a given WSDL for complex financial healthcare structures, HIPPA 276/277 countrywide standard. Incorporated this JAR into EGATE to call the web service by sending in the input parameters via Services approx and getting responses for various situations which had to be developed to handle simple to complex subscriber/dependent test cases through data structures algorithms. Using the JUnit to test various situations, working closely with users, business analysts, QA to provide input/test cases for select health/customers functional/technical guides. Creating training document for the department to train members on the web service implementations. Researching JAX-B and JAX-WS using NetBeans 1.7 and trained team members for future use. Developed and tested the first project to use https protocol in the team. Summary : An enthusiastic and self-motivated Lead Software Engineer with an extensive experience of 8 plus years in the Healthcare domain, in designing, developing and testing large scale software and embedded systems. Strong background in process-oriented software development. Capable of working in a team environment or working independently. I am continually seeking new challenges and a desire to expand knowledge and experience. Skills : C, C++, Perl, Shell Scripts Operating Systems: RTOS (QNX Neutrino), UNIX, Linux And Windows. Software Applications/Debugging Tools: ClearCase/ClearQuest, QNX Momentics, DBX, Cscope, Lauterbach, Code Warrior Rhapsody Network Simulator/Test Tools: Agilent 8960, Rhode & Schwarz CRTU And Anritsu  Office Applications: DOORs, Microsoft Word, Excel And PowerPoint. Excellent Problem Solving And Debugging. Developed embedded application software for an automated plasmapheresis system. The system is a microprocessor-controlled, electromechanical device with valving, pumping, sensing mechanisms with safety and alarm functions. Developed embedded software in C for main processing unit (MPU). The MPU is an X86 compatible. Developed the embedded software in C for main controller and safety processing unit implemented on an arm Cortex M3 microcontrollers. Developed embedded C++ software to support the user interface using photon application builder. Performed software verification, integration, and unit testing through testing on the device and on the simulator. Collaborated closely with system engineering in verifying and approving of new requirement definitions. Provided and proofed of concept and feasibility studies for new proposed concepts and designs. Created software verification test plans, designed reviews, processed and procedure documentation. Developed a network configuration system using expect script to enable configuring of the Lantronix. Summary : 10+ years of combined experience in full software development lifecycle (SDLC) and quality assurance in the Retail domain, with strong analytical thinking, problem-solving, planning and time managing skills, and great attention to details and accuracy. Experience in software quality assurance, including process improvement, manual testing, unit testing and automated testing, with excellent debugging and root-cause isolation skills. Member of NGEN project leadership team, ensured software quality, participated in solution development and project management. Ensured iterative and incremental delivery of etc applications and services, participated in software design & development, and cross-functional collaboration. Contributed to solution development of NGEN system, which replaced the legacy inventory service applications and used new technologies and frameworks for user-experience and performance improvements. One field laptop data processing application with XML configuration files to replace 200+ set of applications of different technologies for significant improvement of user experience and maintenance management. Data collection application with configuration data for the new handheld device to enhance the user experience, performance of data lookup and synchronization. Configuration builder application with step-by-step guidance to generate XML configuration files. Windows web application for management of configuration files, inventory and system related data and provided APIs for data access from all internal or external systems. Windows services to process customer data files or inventory data, and generate reports/outputs using the same encapsulated core modules which run on field laptops. Led design and participated in the development of windows web application and windows services - C#, ASP.Net, entity framework, JSON, XML, SQL Express, Oracle, PL/SQL, Advanced queue, MSMQ. Designed and developed field support application - WPF, C#, SQL Express. 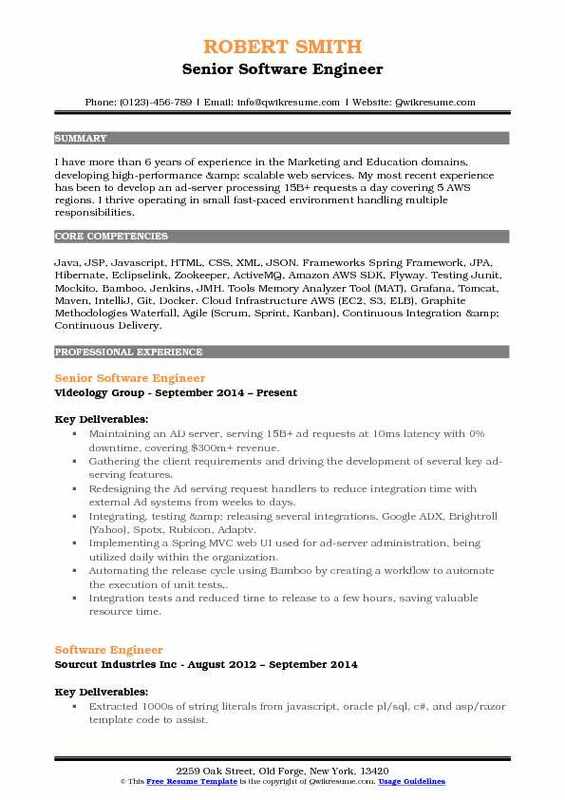 Objective : Junior Software professional with 3 plus years of experience, focused on providing value to all stakeholders. Diverse experience in startup and late-stage companies building, securing, and optimizing modern software development projects and environments. Platforming of Oracle Netsuite campus bookstores offering, a combination of E-commerce, ERP, and POS platforms to support operations of collegiate bookstores. The E-commerce site allows students to purchase, rent, and resell course materials and purchase school merchandise. Designing and implementing new features for the E-commerce platform of the "Campus Stores" product after studying functional requirements documents and reviewing with stakeholders. Coding the solutions using the ECMAScript 6, Node.Js, require.Js, backbone.Js, underscore.Js, amd specification, jquery, netsuite apis, handlebars templates, sass/css, and html. Designing all solutions to follow MVC architecture and designing all models, views using media queries and bootstrap to ensure a "responsive" user experience on a tablet. Deploying to Dev/QA/Demo environments using gulp build/deploy tool. 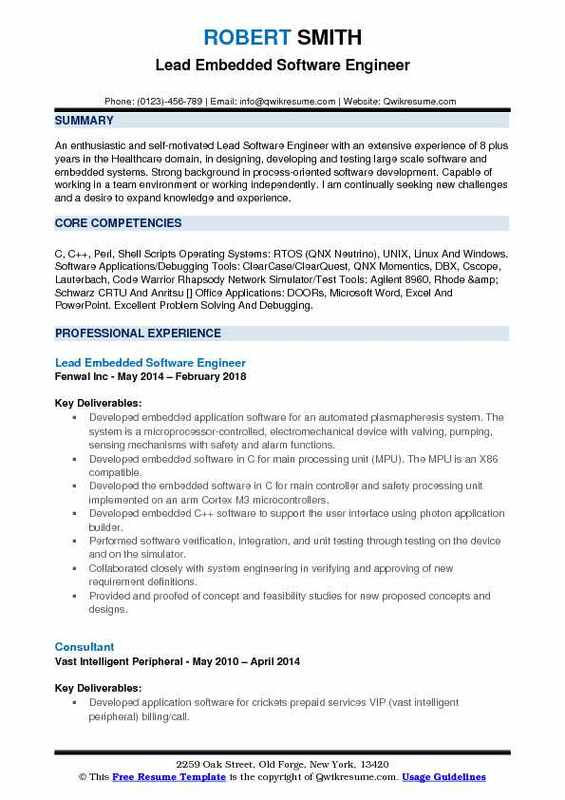 Summary : Software Engineer with more than ten years experience in the IT domain, experience in Analysis, Design, and Deployment, prototype coding, and testing. 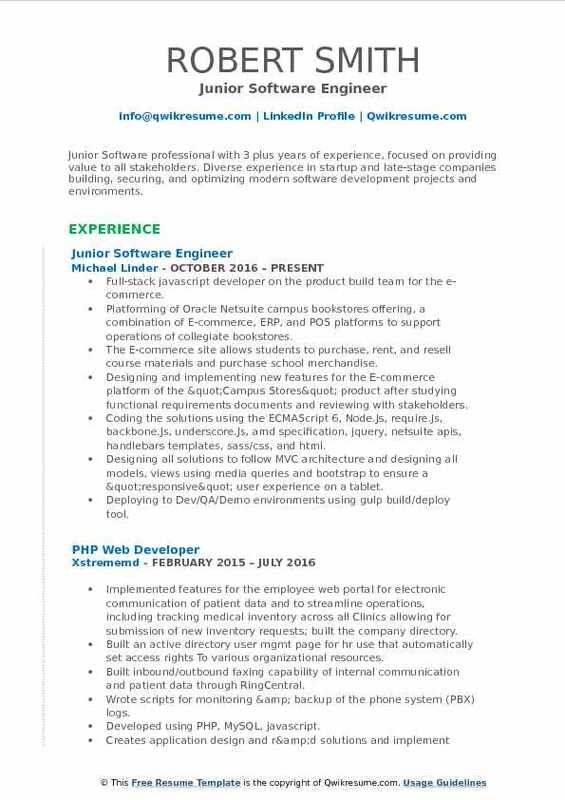 Looking for a position where I can keep learning and use my knowledge and experience. Developing Java-based agent to connect with AWS S3 services for storing and retrieving data stored in the s3 buckets. Developing rich client solutions for enterprise applications using latest Java and Eclipse technologies under various server/client environments. Developing tools/ides using Eclipse Plugins, Java, RCP, GEF, OSGI, Graphite, XML, JSON, TomCat, and JUNIT. Responsible for design enhancement, design, and implementation of new functionality. Implementing graphical visual HQL transformation between the hive and other databases. Using EMF for a model designed and Graphiti(graphical tooling infrastructure) for visual editor implementation. Creating hive tables to store data into HDFS and processing data using Hiveql. Working on importing and exporting data into HDFS and Hive using Sqoop. Working with Apache Spark which provides the fast and general engine for large data processing. Designing and implementing a dictionary builder editor which provides a graphical interface for creating and modifying e-business metadata using GMF based solution. Designing and implementing JSON path builder using Jface and SWT widget. Using nebula viewer, mapper eclipse emf modeling for dynamically presenting business objects. 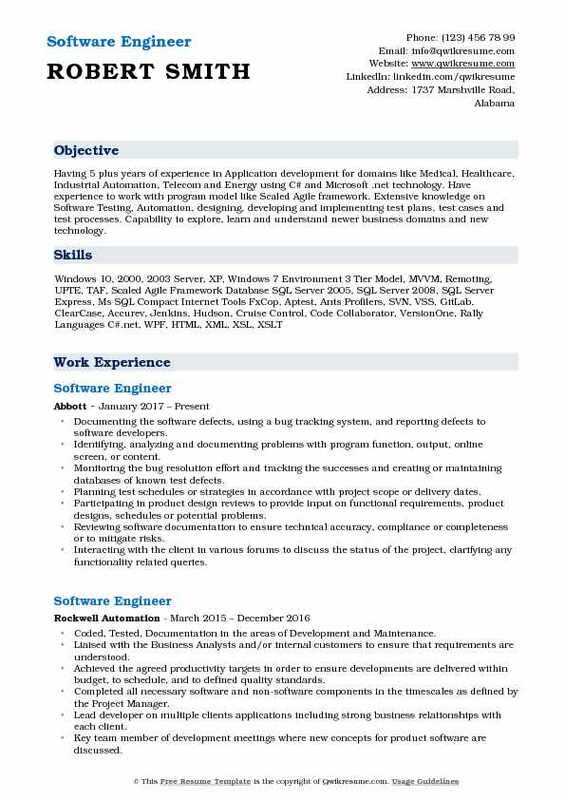 Objective : Having 5 plus years of experience in Application development for domains like Medical, Healthcare, Industrial Automation, Telecom and Energy using C# and Microsoft .net technology. Have experience to work with program model like Scaled Agile framework. Extensive knowledge on Software Testing, Automation, designing, developing and implementing test plans, test cases and test processes. Capability to explore, learn and understand newer business domains and new technology. Documenting the software defects, using a bug tracking system, and reporting defects to software developers. Identifying, analyzing and documenting problems with program function, output, online screen, or content. Monitoring the bug resolution effort and tracking the successes and creating or maintaining databases of known test defects. Planning test schedules or strategies in accordance with project scope or delivery dates. Participating in product design reviews to provide input on functional requirements, product designs, schedules or potential problems. Reviewing software documentation to ensure technical accuracy, compliance or completeness or to mitigate risks. Interacting with the client in various forums to discuss the status of the project, clarifying any functionality related queries. Headline : Computer Engineer with experience in Real Time Embedded Software development and Hardware Integration Testing; Model Based Systems Engineering; Requirements Engineering and Management; Testing, Verification, and Validation; Human Systems Integration; Analysis and Design; Modeling and Simulation; System Resiliency; Integrated Planning, Scheduling, Performance Management; Project Management; Risk, Issue and Opportunity Management; Program Communication, Leadership and Accountability;. Integration testing of ground commands, telemetry, and crew displays components. Scripting of automated testing routines using C, TCL, Python, perl, and linux scripts. Developing code and design for flight software components in adherence with system requirements:. Extensive use of clearquest and clearcase for PR/CR management and codebase maintenance. Subject matter expert for software domains, system-specific issues, processes and regulations. Developing and maintaining of user guides and scripts in use by internal teams. 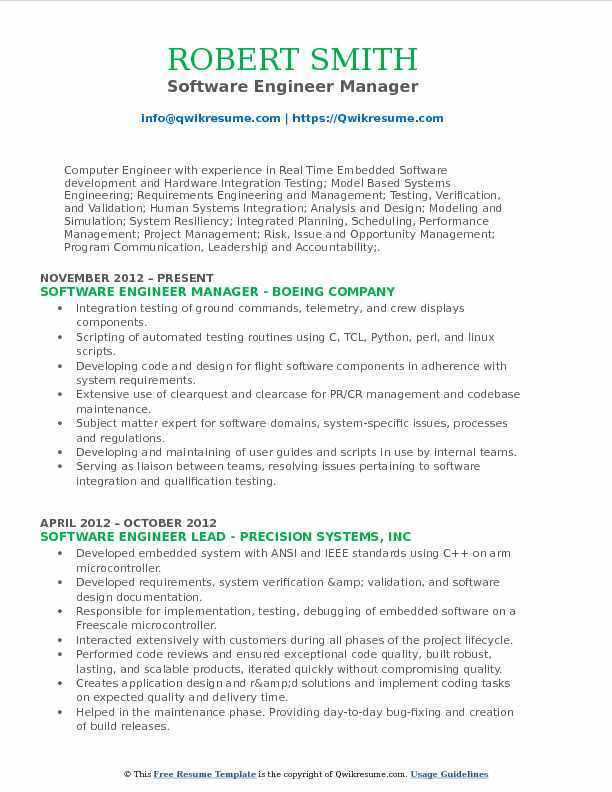 Serving as liaison between teams, resolving issues pertaining to software integration and qualification testing. Working with hardware vendors to integrate new data collection terminals and features into software products. Recommending and implementing the enhancements to improve database performance and data integrity. Administering and maintaining the team foundation server used for source control. Headline : I have more than 6 years of experience in the Marketing and Education domains, developing high-performance & scalable web services. My most recent experience has been to develop an ad-server processing 15B+ requests a day covering 5 AWS regions. I thrive operating in small fast-paced environment handling multiple responsibilities. Maintaining an AD server, serving 15B+ ad requests at 10ms latency with 0% downtime, covering $300m+ revenue. Gathering the client requirements and driving the development of several key ad-serving features. Redesigning the Ad serving request handlers to reduce integration time with external Ad systems from weeks to days. Integrating, testing & releasing several integrations, Google ADX, Brightroll (Yahoo), Spotx, Rubicon, Adaptv. Implementing a Spring MVC web UI used for ad-server administration, being utilized daily within the organization. Automating the release cycle using Bamboo by creating a workflow to automate the execution of unit tests,. Integration tests and reduced time to release to a few hours, saving valuable resource time. Designing a robust message delivery system using AWS S3 and Zookeeper to deliver campaign updates quickly and reliably, with very little overhead across aws regions. Implementing a high-performance client-side load-balancer to eliminate internal aws elb costs, saving almost. Identifying several components for improvement & reduced EC2 instance size by reducing memory footprint by several GB s by careful data structure & algorithm selection. Developing Restful APIs & debug tools used by techops for debugging and to provide insights into ad serving. Working closely with Devops to identify and implement key-metrics for the ad server. 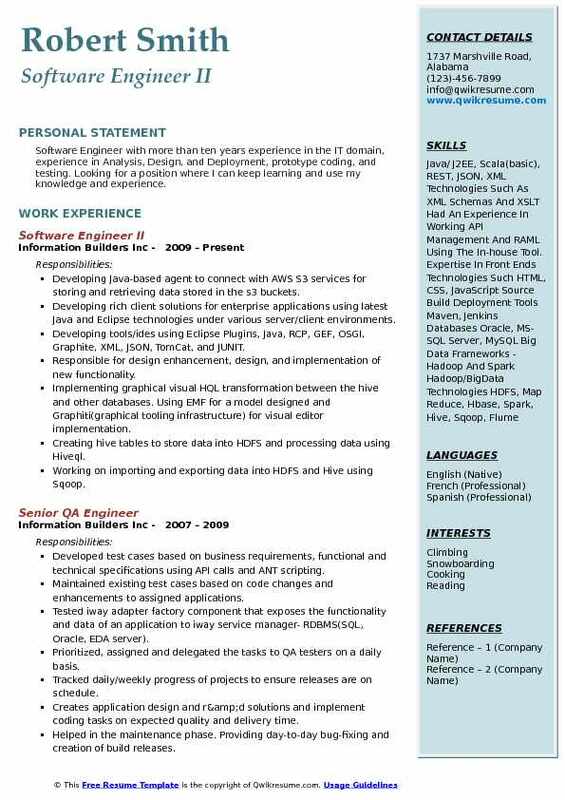 Summary : Software Engineer I with 12 plus years of experience in the Healthcare and Finance domain is seeking to attain a full-time position as a full-stack engineer on a web based application in order to utilize my skills for the benefit of the corporation, stakeholders, and team members. Solely responsible for the UI redesign of the web application to bring an updated professional look. Flexible design using foundation. Researched, designed and implemented an SMS survey feature using Twilio API. Responsible for designing and implementing flexible web parts that were utilized to enhance the user experience. Researched, designed and implemented a new robust and scalable inventory system. Researched and implemented a social media login for the web application using securesocial. Wrote maintainable, commented and extensible code in a team environment. Worked closely with the CTO and CEO to gather requirements and to ensure the work produced meets and exceeds expectations. Consulted regularly with the CTO and stakeholders on project status and technical issues. Rapidly prototyped mobile application to confirm feasibility and gather feedback. Designed and implemented scalable and robust hybrid mobile application for Android and IOS. 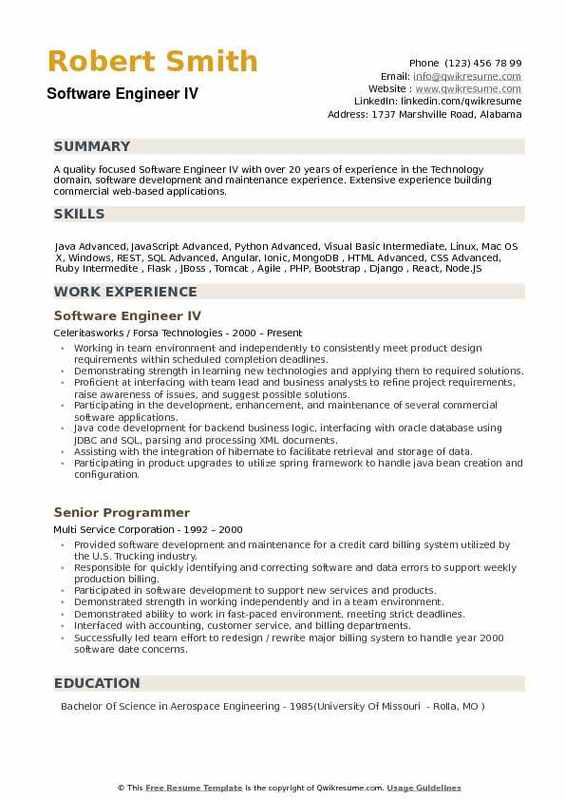 Summary : A quality focused Software Engineer IV with over 20 years of experience in the Technology domain, software development and maintenance experience. Extensive experience building commercial web-based applications. Working in team environment and independently to consistently meet product design requirements within scheduled completion deadlines. Demonstrating strength in learning new technologies and applying them to required solutions. Proficient at interfacing with team lead and business analysts to refine project requirements, raise awareness of issues, and suggest possible solutions. Participating in the development, enhancement, and maintenance of several commercial software applications. Java code development for backend business logic, interfacing with oracle database using JDBC and SQL, parsing and processing XML documents. Assisting with the integration of hibernate to facilitate retrieval and storage of data. Participating in product upgrades to utilize spring framework to handle java bean creation and configuration. User interface enhancements to integrate Jquery, Ajax, and Json to improve functionality. Successfully handling numerous minor application enhancements, upgrades and bug fixes. Utilizing these other relevant technologies: Mongodb, ANT, Eclipse, Subversion, JIRA, BIRT (business intelligence and reporting tools), Tomcat, Maven, GIT, Struts, Junit, Bootstrap, AngularJS, Jquery mobile, and Intellij IDE.